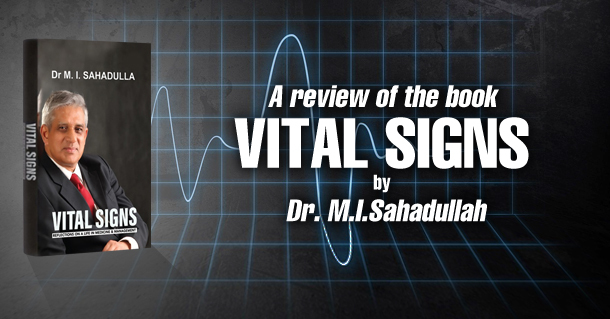 Much later, when Dr. Sahadullah’s first book, ‘Vital Signs’ was launched by the Kerala Governor and I had a chance to read the highly readable and elegant volume, I realised that Dr.Sahadullah is not only a highly qualified and professional physician and medical entrepreneur, but also someone who straddles the old method of touching, feeling and using the simple stethoscope rather than the new method of the machines diagnosing and the doctors merely following the technical directions. The very first chapter of this book, which he claims is neither an autobiography nor a book on medicine or health care is about the change in the practice of medicine in India. He has embraced technology fully in his hospitals, but remembers nostalgically of the old days when diagnosis was more an art than a science. “The various aspects of physical examination– touching the patient, using the stethoscope to listen to body sounds, doing a bit of percussion, feeling the abdomen, examining the nervous system and so on– happen to a much lesser extent today.” This is very unfortunate as it pushes up the cost of care since patients are often asked to do tests they do not really need and the reliance on technology limits the doctor’s ability to build a relationship with the patients. The decision that Dr.Sahadullah took in the case of Lekha was part of the KIMS philosophy of being friendly to the patients. He also reveals in the book that unlike many hospitals, KIMS does not fix quotas for doctors to earn money for the hospital.